Dina Pradel, Director, Marketing, StyleFeeder, Inc.
We’re in what I like to call the WiFi black hole, a session room that the WiFi can’t quite reach. The moderator for this session was setting up and he asked the AV staff to make sure the Internet connection was working. I piped up and said there’s not Internet connection here. The weird look response I got was explained when my buddy Simon Heseltine told me that the connection is hard wired on the presenters’ table. Oh. Right. I’ll shut up now. Stewart says that this session is apropos since we’re in New York. NY, London, and Paris Fashion Weeks just wrapped up. In Paris, a nine-year-old blogged a show. In London, the Prime Minister’s wife was forced to stand when a blogger took her front row seat. And they didn’t kick the blogger out. They celebrate street style and they count beauty in their fashion, like make-up and hair. That helps them deliver on the promise of helping every woman look their best. Of course, there’s no point of creating all the content if it can’t be found. Link it! If you like it then you should have put a link on it. They love other bloggers. They’re doing product reviews with 3 bloggers and 1 product. Offer a place to give feedback at the top and bottom of every page. Jared is up next. He’s a major entertainment and celebrity blogger. His site brings together a very diverse crowd and they’re trying to optimize for that broad audience now. The site takes a very positive tone. He spun off a teen site to capitalize on their success. One of the revenue streams he has is Pixazza. It monetizes pictures by putting an ad for the same or comparable look as the celebrity photo on the page. BuzzStyle lets you search for products that are similar to what a particular celebrity would wear, and you search by celebrity. They also monetize with home page takeovers that last a day or a week. They also do contests that engage readers that are very fanatic about celebrities. They’re also on Twitter, which lets them engage: @jaredeng, @justjaredjr, @justjared. They also send referrals to other blogs, and that means good relationships in the field that give back as well. They work with fashion houses, brands that want to get their IDs on the site. Dina takes the podium next. 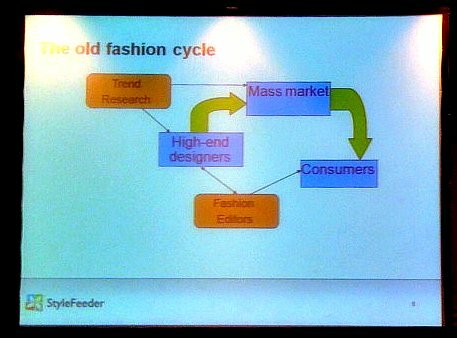 StyleFeeder is a personal shopping engine. It provides a customized experience that helps shoppers find what they’re looking for faster. The site has social media roots. They look at the other users they choose to watch, the products they put on their style feed, they look at the star ratings they give and they weigh these things to figure out what your personal taste is. 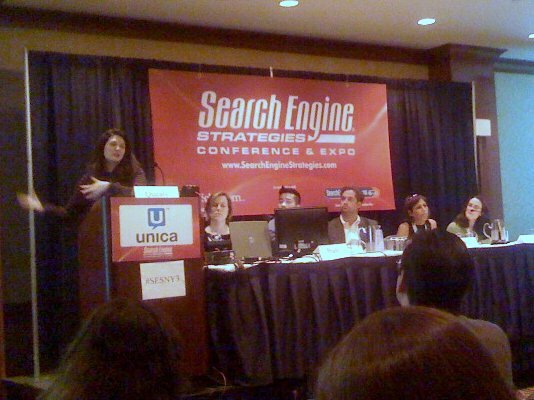 As time went on they started getting a lot of traffic from search engines. They realized these users had different wants and needs. So they started to ask visitors what they were looking for. From that feedback they created a new browse display and more ways to filter a search. When a search engine visitor comes to the site, they know two things: IP address and Web browser. With the IP address they order search results factoring in what’s popular in that area. Some users had let them know that their engagement on the site made users feel like they were blogging. They liked the connection so decided to launch a blog. The blog has also been a popular tool for their affiliate partners that get to post their original content on the blog. A lot of the topics covered on the blog have a long shelf life and continue to drive traffic. 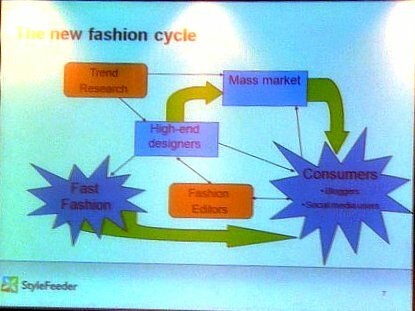 She sees a meshing of fashion editorial expertise and what social media sites are seeing/doing. Fashion editors aren’t going to go away and will continue to influence fashion, but now more than ever, the data coming from social media sites speaks for itself. Lauren is next to give us a tour of her site. It’s a fashion industry news and analysis site. They average about 400,000 unique users a month. They’re part of a network of four sites and each covers a different industry. They’re the only one that speaks to both insiders and consumers. One big difference between online and print fashion publications is headlines. In magazines the headlines are very clever. That doesn’t really work online because readers want to understand the gist before they read so the headline should include news. They draw people in by writing about controversial topics. They have good connections so they can talk to the right people when news breaks. When a scandal went down last week, their coverage got great traffic. She thinks that as time goes on there’s going to be less and less of a distinction made between bloggers and reporters. Last up is Caroline walking us through her site. The site covers NY Fashion Week for Fashion TV. NewYorkGirlStyle started in NY and now it’s in Milan, Madrid, London, Hamburg, Los Angeles. One of the biggest campaigns they have is a Swatch giveaway every month this year. You can enter the giveaway through Twitter and their other social media. All their campaigns are tied to social media. They’ve had a huge Twitter response globally. It’s part of what they deliver to their partners, like Swatch. They’re also working with Kenneth Cole. It has style guide videos. The videos are hosted on YouTube, and they tie it into their Facebook and Twitter accounts. The brand is growing and traveling the world.